Starting 2018, May 16th of every year will be celebrated as the International Day of Light (IDL) according to a UNESCO Resolution approved on 19 September 2016 in Paris. The IDL is administered by a steering committee formed by an alliance of light-based international organizations and professional societies. The Samahang Pisika ng Pilipinas supports the IDL (in Filipino: Pandaigdigang Araw ng Liwanag, PAnL) and is hosting a series of optics and photonics exhibits/workshops at different school-based venues in the country throughout the year. In the first part of this workshop, highlights of PAnL 2018 activities will be presented and suggestions will be given on how one can get involved in this global initiative. The theme for PAnL 2018 is Liwanag Para sa Lahat and aims to make light-based technologies and research accessible to everyone. Spectroscopy is a family of techniques for the various investigations of light-matter interactions and allows for qualitative and quantitative analyses of emission, absorption, fluorescence, and others. Online resources provide instructions on how to build handcrafted spectrometers and use freely available instrumentation software to control them. The second part of the workshop is a hands-on activity on the construction of a Bahaghari Spectrometer: a do-it-yourself laptop webcam spectrometer. Bahaghari is a Filipino word for rainbow, which is a prism refraction effect. Here Bahaghari is adopted to describe the similar spreading of light into a spectrum this time by means of a grating diffraction effect. The design features of the Bahaghari Spectrometer include easy-to-assemble cardboard cutouts, sharp-edge narrow slits, and inexpensive grating films. The spectrometer will be calibrated using a light source of known spectra and will finally be applied in various spectral investigations. Participants are required to pre-register for the workshop here: Registration link. Percival Almoro is a Professor at the National Institute of Physics of the University of the Philippines Diliman. He is a Senior Member of the Optical Society of America and Topical Editor for the Applied Optics journal in the fields of holography, interferometry, and phase retrieval. Dr. Almoro is a member of the International Day of Light (IDL) National Nodes and chair of the local organizing committee composed of members of the Samahang Pisika ng Pilipinas that leads local campaigns, activities, and events related to the IDL. The Bahaghari Spectrometer project of the SPP is deemed important as a small step towards more further research in optics and photonics with local contexts and applications. P. Almoro. 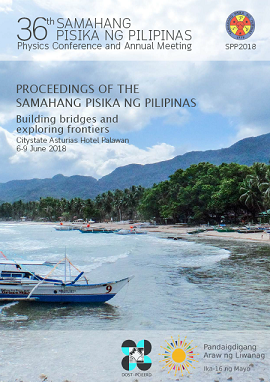 International Day of Light Workshop: Bahaghari Spectrometer, Proceedings of the Samahang Pisika ng Pilipinas 36, SPP-2018-INV-3G-01 (2018). URL: https://paperview.spp-online.org/proceedings/article/view/SPP-2018-INV-3G-01.